I’m a big believer in menu planning. 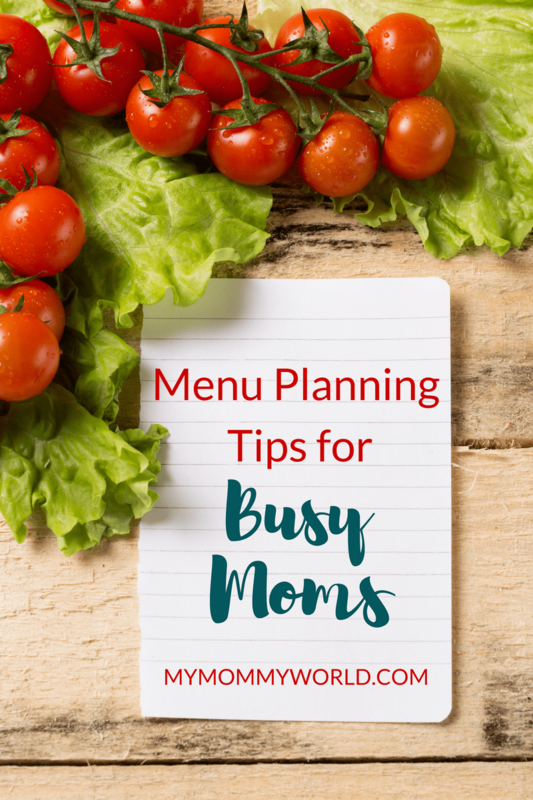 In fact, if I had to give one tip to a new mom, it would be to start planning a dinner menu each week. When it’s late in the evening, and my kids are whining because they are hungry, my menu plan makes it easy to get dinner fixed fast because I already have a meal ready to prepare, with all the ingredients in the refrigerator. 2. Look for bargains. Read your local grocery store’s ad, choosing meats/main ingredients that are on sale that week to decide what you are going to make for your dinners, then shop for your menu items. Matching coupons to items that are on sale is the best way to lower your food costs. If one ingredient is a common denominator in many meals, consider buying in bulk to save money. Common staples like milk, eggs, bread and sugar can be bought in bulk as well. Some stores will have double or triple coupon days when you can save even more. 3. Search online. After a while, your family will get tired of chicken and rice every Thursday. You can get into a menu rut sometimes. Use the Internet to search for new and exciting recipes. My Recipes board on Pinterest has lots of great meal ideas. You can also get ideas from my weekly Menu Plan Monday posts. Learn to put a twist on old recipes for a new taste. 4. Have a leftover night. After preparing meals for five or six days, there is bound to be some food left over, unless you eat them for lunch, like we do. Designate one night to be leftover night and let everyone mix and match for dinner. It saves mom from having to throw away any food. I also like to plan Breakfast for dinner one night each week, because we don’t have time for a big home-cooked breakfast on weekdays. Great tips Erin. We eat our leftovers at lunches, but occasionally we have enough for a second dinner which is nice. I also believe in doing prep work in advance. It really helps when you are in trying to get dinner on the table and after a busy day. I menu plan 5 weeks at a time. I take a couple of hours every 5 weeks to go through out pantry and freezer. I plan our meals with what we have on hand. I make a shopping trip for the main items we are lacking, then each week I just pick up what I need for fresh items and purchase any sale items for the next month. Menu planning really helps me keep our grocery budget lower. For the past few weeks, I’ve gotten out of the habit of planning a weekly menu. Not good, I know. But for a long while I did. I think the holidays kind of changed how we did meals, etc… and I just need to start again.